Business Transactions - Shapiro, Blasi, Wasserman & Hermann, P.A. Michael Shapiro, a founding shareholder of the Firm, heads this practice area. Together with senior named shareholder Andrew Blasi, senior associate Linley B. Schatzman and a staff of experienced paralegals, they comprise the Real Estate and Business Transactions practice. We also handle various business transactions, including all types of asset purchase and sales, entity formations, and stock purchase and sales. The commitment to this practice area is substantial. Through our years of experience, we have established relationships with virtually all of the major lending institutions and real estate brokerage firms. This solid background is invaluable in facilitating the successful consummation of each and every transaction. Further, we can confidently recommend other professionals that will help to facilitate each transaction. Our goal is to offer all real estate and transactional clients the most up to date and sophisticated range of legal services available. Shareholder Adam S. Chotiner oversees the firm’s ADA Public Access Lawsuit and Compliance practice group. This group’s practice is focused on litigation and compliance under Title III of the Americans with Disabilities Act of 1990 (the “ADA”). Over the past 20 years, there has been an explosion in the number of ADA Title III lawsuits being filed, particularly in Florida. Such ADA lawsuits often allege the existence of “physical barriers,” such as inaccessible restrooms or parking lots. A more recent trend is for ADA lawsuits to allege that a company’s website is inaccessible to visually-impaired individuals. Mr. Chotiner has extensive experience defending claims under Title III of the ADA and assisting businesses with ADA compliance, including assisting clients with onsite inspections, negotiating with the plaintiff’s attorney to resolve matters as early as possible in litigation and making recommendations as to necessary modifications. Mr. Chotiner’s clients include a wide variety of businesses, from “mom and pop” businesses to companies listed on the Fortune 500. Sometimes litigation does not end at the trial level. When an appeal is pursued, the firm’s Appellate practice group is ready to step in with its extensive experience. The firm’s Appellate practice group is chaired by Adam S. Chotiner. The firm handles appeals in both state and federal court, and within the full range of legal matters covered by its other practice groups — from commercial and construction litigation to probate litigation, from labor and employment law to family law. Jeffrey P. Wasserman has now expanded his practice to offer Collaborative Law as the alternative process in helping clients resolve their differences with their spouse. He has been properly trained and certified as a Collaborative Lawyer. Continuing with his education and training in Collaborative Law helps him provide the best service possible for you in this process. Jeff has come to recognize the benefits and need for resolving divorces through a process that keeps the parties from entering the unknown realm of the courthouse. The Collaborative Practice of Divorce Law assists people to find creative solutions without litigation. It helps the parties to achieve a fair outcome with the least amount of emotional and financial cost. Collaborative law permits the parties to resolve all issues relating to support (spousal and child) and dividing assets and liabilities just like having them resolved by a Judge. In this process, you are in charge of your own destiny and you move at the pace set by both parties in coming to a resolution. Instead of a Judge and unfamiliar Rules setting the pace and process, you will have the benefit of legal and mental health professionals and experts to guide you through to the end in a non-litigious setting. Please contact Jeff for more information on Collaborative Law if you are interested in this process for resolving the issues of your divorce. 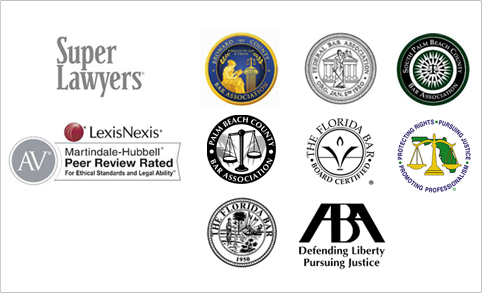 The Commercial Litigation practice group consists of experienced attorneys all of whom have trial and appellate experience in all courts of the State of Florida, as well as in Federal District Courts throughout Florida and the Federal Court of Appeals for the Eleventh Circuit. All of the attorneys represent clients from Fortune 500 companies to small businesses and individuals in all types of matters including but not limited to contract disputes, business disputes, defamation claims and commercial torts. Firm attorneys are also admitted to practice in the United States Supreme Court. Shareholder Andrew Dector and senior attorney Robin Frank comprise the firm’s Construction Litigation practice group. The firm represents contractors, subcontractors, owners, sureties, material suppliers and design professionals, both as plaintiffs and defendants in construction-related litigation and mediation. Jeffrey Wasserman heads the firm’s Family Law practice group. He is the former Chair of the Family Law Section of the Florida Bar (2000-2001) and the former Chair of the Florida Bar Family Law Rules Committee (2004-2005). He is currently serving on the Florida Supreme Court Family Law Forms Workshop which he Chaired in 2007 and 2008. Mr. Wasserman has been recognized by Martindale-Hubbell as an “AV” rated lawyer for many years; is recognized in Who’s Who; and has consistently been recognized as a “Top Lawyer” in South Florida Legal Guide and as a “Super Lawyer by Super Lawyer’s Magazine. In a rapidly changing and complex regulatory environment, our dedicated Florida Healthcare attorneys deliver exceptional results, addressing cases in complex litigation, transactional, operational, legislative and regulatory matters. We guide clients in a manner that ensures compliance, balanced with cost-efficient resolution of disputes. Shareholder Adam S. Chotiner oversees the firm’s Labor and Employment Law practice group, which also includes senior attorney Robin I. Frank. The group’s practice is focused on the litigation of labor and employment law disputes, as well as preventive labor relations. The firm primarily represents management. The firm’s attorneys are well experienced in all aspects of probate, trust and fiduciary litigation. The firm’s Probate, Trust and Fiduciary Litigation practice group regularly engages in the evaluation, consultation, litigation and mediation (as both mediator and advocate) of disputes involving trusts, estates and fiduciary relationships. The firm’s clients include corporate and individual trustees, banks, investment professionals, personal representatives (executors), administrators, guardians, beneficiaries and other companies and individuals who are involved in disputes concerning trusts, estates and probate actions. Our Florida product liability team is made up of accomplished trial attorneys who have extensive experience defending a wide array of corporate interests, including international manufacturers of heavy equipment, pharmaceuticals, automobiles and vertical transportation systems, as well as cosmetic companies, industrial developers, and component part manufactures/distributors. These cases range from serious personal injuries to individual and class action warranty disputes or claims of defect, and they are litigated at both the State and Federal level. Michael Shapiro, a founding shareholder of the Firm, heads this practice area. Together with senior named shareholder Andrew Blasi, senior associate Linley Schatzman and a staff of experienced paralegals, they comprise the Real Estate and Business Transactions practice. Senior named shareholder Andrew B. Blasi oversees the Firm’s real estate litigation practice group, which includes shareholder Andrew M. Dector and senior attorney Robin I. Frank. This practice group is focused on the litigation of all types of litigation based upon real property and real estate deals gone bad. The group devotes a large part of their practice to representing and assisting buyers in pre-construction real property contracts seeking to revoke or rescind the sales contract, to recover deposits paid by the buyers to sellers/developers and to recover any other damages the buyers have incurred where builders or developers have failed to comply with the requirements of the law, most notably the Federal Interstate Land Sales Full Disclosure Act and the Florida Condominium Act. With an overabundance of condos and houses on the market and values plummeting, the group continues to represent and assist buyers in demanding and getting refunds of their deposits along with damages against developers who have failed to conduct their business in a legally appropriate or required manner. Please enter your email address below to stay informed with Shapiro, Blasi, Wasserman & Hermann, P.A. Contacting Shapiro, Blasi, Wasserman & Hermann, P.A. or any individual Shapiro, Blasi, Wasserman & Hermann, P.A. attorney or employee via the internet does not create an attorney-client relationship without our prior written agreement. Please do not send us any information you regard as confidential unless and until we have agreed to a formal attorney-client relationship. Information conveyed prior to establishing an attorney-client relationship is not privileged or confidential. You should also be aware that information you convey to Shapiro, Blasi, Wasserman & Hermann, P.A. via the Internet may not be secure. Shapiro, Blasi, Wasserman & Hermann, P.A., with offices located in Boca Raton, Florida and Hollywood, Florida, has practice areas in Commercial Litigation, Labor and Employment, Construction Litigation, Chinese Drywall Litigation, Bankruptcy and Creditor's Rights, Real Estate Transactions, Real Estate Litigation, Business Transactions, Family Law, Wills, Trusts and Estates, and Appellate Matters. We represent clients throughout Florida and nationwide.